Illinois researchers found that the shape of a tumor may play a role in how cancer cells become primed to spread. 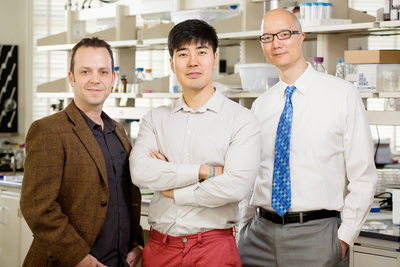 From left: materials science and engineering professor Kristopher Kilian, graduate student Junmin Lee and veterinary medicine professor Timothy Fan. CHAMPAIGN, Ill. — Only a few cells in a cancerous tumor are able to break away and spread to other parts of the body, but the curve along the edge of the tumor may play a large role in activating these tumor-seeding cells, according to a new University of Illinois study. The American Cancer Society and the National Science Foundation supported this work. Kilian is affiliated with the Carl R. Woese Institute for Genomic Biology, the department of bioengineering and the Micro and Nanotechnology Laboratory at Illinois. Editor’s notes: To reach Kris Kilian, call 217-244-2142, email: kakilian@illinois.edu. The paper “Interfacial geometry dictates cancer cell tumorigenicity” is available online or from the News Bureau.